And now it's time for our first ever Cigar City beer on Feature Beer Friday!, the Jai Alai IPA, which is one of their several year-round flagship brews. The name Jai Alai is a throwback to an old Spanish game that used to be popular in the Tampa area, but is no longer played there. It's unfortunately not yet available in Louisiana, but rumors have it coming before too long. In the meantime, a trip to Florida or I'm pretty sure Alabama and you should be able to find plenty. The Jai Alai is a single IPA, but it's really bordering on imperial at 7.5%. Some websites use 7.5% as the cutoff but there really is no defined line between an IPA and DIPA, it's all up to the brewery. It's not like a bourbon that has to meet exact characteristics to be able to be called a bourbon. 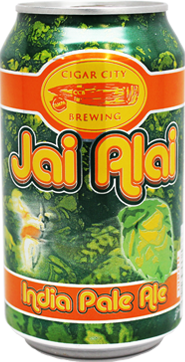 Jai Alai is the aforementioned 7.5%, with 70 IBU, again on the high side for an IPA, but go big or go home, right? Appearance: Deep amber, hazy with a nice head. Aroma: Orange, citrus, not overpoweringly malty. Definitely an IPA but more on the fruity citrus side of the hop spectrum. Taste: Hoppy, again on the citrus side, and Brenton said it was a smooth drinker. Mouthfeel: Easy drinking, the relatively high abv is barely noticeable. Overall: An excellent IPA, available in cans for your next trip to the beach. Just watch out, or the 7.5% will sneak up on you! We all really enjoyed this one with scores consistent from 70-80.